"I cater to several layers of sensibilities"
NIRMAL VERMA, the pioneer of the Nai Kahani movement in Hindi and a rather late Jnanpith award winner, has to his credit eight novels, five short-story collections and nine books of non fiction. The recent Padma Bhushan has surprised him. "I was not expecting it," he laughs and closes the subject. 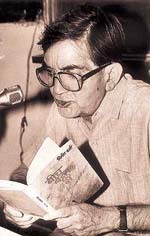 His unique language and unorthodox style shook the Hindi world with the publication of his first short-story collection Parinda in 1958. Considered an ‘outsider’ by his ‘progressive’ contemporaries for refusing to exhibit the party flag, Varma refuses to flow into the abyss of empty metaphors. He has always managed to weave an ambience of ideas that offer glimpses of the eclipsed man-woman relationship sans sentimental hypocrisy. What is special about his fiction writing is that he has never been cruel to any of his characters that are mainly drawn from the ordinary upper middle class. Never ‘apologetic’ about the essence of ‘Indianness’ in his essays in spite of being labelled right wing by several critics, Varma’s succinct details bring vividly to life the trauma and anguish of surviving in a society that is desperately in search of its roots. In all your short stories and novels, there is an omnipresence of existential crisis where almost all are lonely and forever in a state of anguish and torment. What has have made you create such people and situations? My works essentially deal with situations arising out of troubled relationships among the members of the same family or strained man-woman ties. Indians are very accustomed to the joint family system with strong ties of kinship. But in the last 30-40 years, increasing industrialisation and massive migration of people has taken its toll on the system. With the evolution of the nuclear family, everyone now has to lead his own life. The disintegration of the joint family has snatched the feeling of security from individuals who now have to bear strains and tensions alone. The second most important development is the emergence of an independent woman — a woman not dependent on others but a person who has the capacity to stand on her own feet. In the past, the Indian woman has been a victim of many malpractices and injustices that were operating in our family system. The emergence of the ‘new’ woman has created a sort of a revolution in the network of human relationships in society and also led to peculiar tensions. These important developments in the Indian family system and society have created situations in relationships that have become central themes of my fiction. You have been very objective in your writing and have never taken sides. How do you personally identify with your creations and manage to detach yourself from them? Yes, I try to be completely impartial and objective when I am writing. The whole purpose of my writing is defeated when one side has all the nobility and truth and the other is the bearer of intense guilt. As you see in my stories and novels, the problem is not that one is guilty and the other is not. In fact, everyone is participating in some tragic drama for which each one of them has certain responsibility. You can do this with great artistic authenticity only when you refuse to take sides and remain invisible. So the author has to be what T.S. Eliot called ‘impersonal’. It is when your are impersonal that you become objective — one who is sympathetic both to the ‘Kauravas’ and the ‘Pandavas’. If you start taking sides, the entire conflict becomes one-sided. You see the most painful predicaments and artistic spaces in the Mahabharata are those where you fail to decide — whom to blame, on which side is the truth? This helps you to enhance your perception of the richness and complexity of human life. Have you deliberately avoided socio-political themes in your fiction and included them in your essays? It seems as if they were catering to a different set of intellectuals? Essays are an important and indispensable part of my writings. They complement my fiction. The questions that I cannot raise in the limited frame of my short stories and novels are raised in my essays. Therefore, subjects like industrialisation, religion and secularism have become important themes of my essays. My essays have antagonised many people. Many love my fiction but hate me for my articles and essays. They think there is a lot of dichotomy in me as a writer. But, I am not complete without the other. I am certainly not catering to different people but different layers of sensibilities in the same person. The progressive writers have cited the absence of contemporary socio-political conditions in your fiction and accuse you of being distanced from what they term as ‘relevant’. Who decides what is ‘relevant’? The government, the party or the leader? How can you define relevance? Usually the Left parties take upon themselves the authority to decide what is actually ‘significant’. One has seen their own definitions becoming so irrelevant. What they considered relevant in Stalinistic times is termed unimportant by these very people now. You see, ‘relevance’ of art is in itself a meaningless term. One has seen the hollowness of terms like ‘significant’ and ‘socially important’. This is not literary criticism, but literally abuse. Some of your essays and articles are in English. Haven’t you ever felt an urge to write your fiction in English, especially when Indians writing in English are today gaining so much publicity and enormous financial benefit? When I started writing, my contemporaries like Mulk Raj Anand and R.K. Narayan were struggling for a livelihood as those who were writing in Indian languages. Big advances running into millions of dollars were unthinkable at that time. Anyway, if I was asked to write in a language other than my mother tongue, I would refuse. The reason is that my stories and novels are very much a product of my emotional world, and the language of my inner world is Hindi. Naipaul’s India has ‘improved’ from An Area of Darkness to A Wounded Civilization. You have accused those who disown Naipaul as having a ‘Taliban’ mentality. Please elaborate. We Indians are so accustomed to hating ourselves. So if a person who was critical of India earlier suddenly starts praising the country for its rich heritage, he is seen suspiciously. Our ‘progressives’ do not like him much because Naipaul has been critical of the damage that years of Muslim invasions did to the Indian civilisation in terms of burning of libraries and destruction of temples. This left a deep wound on the Indian psyche — the reason he calls the Indian civilisation a wounded one. When you asked me about objectivity, I think Naipaul is the most objective observer. We Indians have this burden of ‘guilt’ that if we talk about the richness of our culture we will be accused of being a BJP or a VHP person. Naipaul does not have any such worry. That is why there is so much truth in his statements, and truth is always bitter for those who, like the extremists, want it to be suppressed. When do you plan to write an autobiography? I think my entire writing is an autobiography (laughs). In fiction, you can be objective because you are not trying to be factual, but truthful. When you are being truthful in the abstract sense of the word, you talk about the individual whom you have created. Although you wish to be as honest and as objective about yourself when you write your own story it seldom happens and distortions come in.